Check out my new "Recipe" over at the Moda Bake Shop! Inspired by my all time favorite quilt made by my great-grandmother. I have been creating Valentine decor this year....like crazy. Since tutorials and patterns writing can be difficult and time consuming I decided many of ideas will likely remain mine. And maybe blogging a picture will inspire someone else to create new instead of copy?? Both are beautiful. Like Vickie says, my inspirations have changed. I really like the traditional look of old quilts; but I also like the freshness of more modern ones. What a wonderful tribute to create, using the original from a treasured family member as a starting block! Love it! 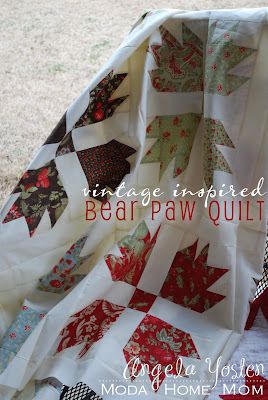 I loved the look of old traditional quilts they have always inspired me. I think both quilts are wonderful love the old one for all the stories it tells. The new old is beautiful and will have its own stories to tell. Thank you for sharing. So nice to get inspiration from the past. And it is a wonderful modern day interpretation. What a wonderful tutorial, and a beautiful quilt. I mainly get my inspiration these days from tutorials or magazine or a fresh new collection of fabrics from Moda. It is hard not to be inspired by those! i'm inspired lots of things... but mostly by fabric.. all kinds! i love that you made this based off of a vintage favorite.. good idea! Thanks for the great tutorial! I have the perfect fabric that i've been holding on to not knowing what to do with it and i think this will be PERFECT! 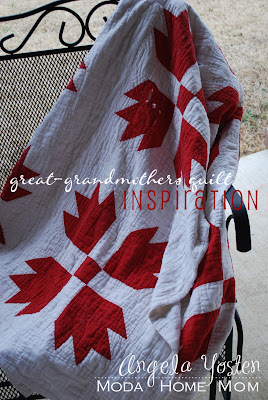 Love the quilt ... and what inspires me ... great tutorials and all the fabric ... i just love the fabric. That is beautiful! You did an amazing job!! I'm inspired by others' crafts. I'll see something and it will spark something in my brain of what I want to do! Sometimes, their stuff is so good that I want the same thing (which is why I am thankful for tutorials)! All things Moda inspire me!....i thinkt that it is the colors and feel of the fabric that really speak to me. BTW-Hope you Little Guy is back to normal! How is your little boy feeling? I hope he continues to do well, and that you are somehow about to grab some restful moments here and there.